My sister Ernie Jane Nishii was a free spirit. She was a true artist who never cared about selling her art or worldly thoughts. We shared core values of love, peace, and harmony. We were children of the camps. 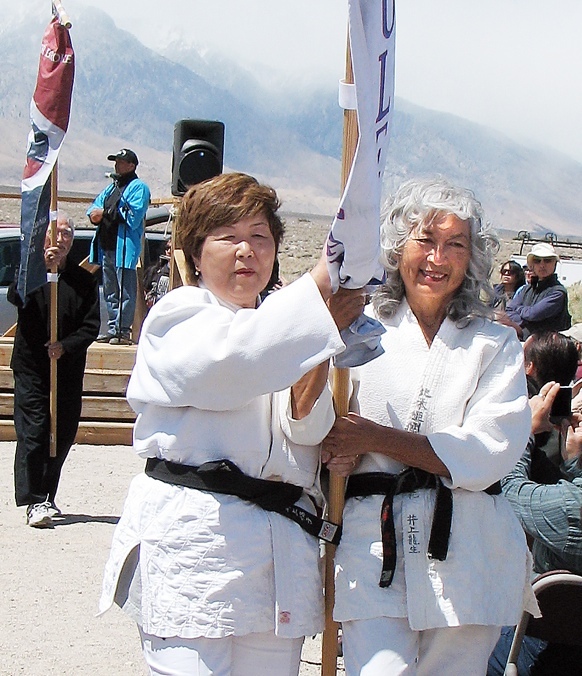 You may remember us as two old ladies wearing judo gi during the Manzanar Pilgrimage carrying the Tule Lake banner. We wanted to honor our parents, who stood for their principles as resisters. She called “Masako” her camp name. In the ’50s-’60s, we practiced judo kata with our father, Tatsuo Inouye of Senshin Dojo. She earned a second-degree black belt as a teacher there. She loved the process of learning so much that she went to 12 schools of higher education. She matriculated at San Jose State. Her passion was to learn about sculpturing using Mother Earth and further, traveled to Japan to see their kilns. She participated in exhibits at Lela, Bergamot Station, and Gardena Valley Japanese Cultural Institute, and her work can be seen starting this month at Hoson House in Tustin. Her college friends Tomiko Yabumoto and Betty Lee lovingly said that she was impractical but she was the lucky one who had three precious sons with her husband, Kikuo. Grown sons Ernie, Brent of Japan, and Matt were unified in her well-being until her last day, June 15, 2017. She was beautiful with her striking looks and shades of purple in her mid-length wavy white hair. Fluent in Japanese and English, she discovered music was her third language and sang “Besame Mucho.” Her eyes lit up when her granddaughter Yuri sang “Hamilton,” or when Yui and Karin sang “Dogwood Flowers.” She gave the gift of song to her offspring. She was ahead of her time, cutting up jeans, and making sushi cake with mangos and lemon peels. She was creative in every field she entered and never cared what others thought. She attended PFLAG and Shift Happens, and NAAMI meetings with Harold Kameya, a mentor. Everything came from her heart and hands. As a ceramist, her voice became stronger after visiting Tule Lake in 2009. She felt disquieted and began to express herself in iconic ceramic and porcelain compositions called “Endure,” “Show Me the Way Home,” and “Our Family.” It consisted of personal vignettes like my mother holding a baby — me. Mama said that four-year-old Masako cried for Daddy when he was away for 100 days as a prisoner in the Tule Lake Segregation Center stockade. Some faces that you see now on her pieces come from her daily nightmares as a child. Ernie Jane taught elementary-age children to explore sculpting at home and at the San Fernando Valley JACL’s Suzume no Gakkou summer camp as well as Camp Hanabi at the Southeast Japanese Language School and Community Center. She wanted to continue teaching ceramics at the Irvine Fine Arts Center in Santa Ana, which was her home away from home for 32 years, but her vitality began to wane. During the month of January, we had a chance to sleep together while we sought her diagnosis. We talked each morning and laughed about our childhood memories. It was a happy time for us. By March, the second opinion confirmed that she had ALS/Lou Gehrig’s disease, a miserable neurodegenerative disease with no cure. I had to listen closer since she could no longer speak above a whisper. She used her handy iPad and, amazingly, signed her last tax form with a flair. During February and March, Dr. Mikio Tachibana visited her at Beachside Nursing Center every week. His parents came to America on the same ship as the Nishii family. Her life was extended further by ten more weeks at the home of Ernie and Young in Cerritos. They went on excursions almost every, day including visiting our departed grandparents in the Lancaster Cemetery during the poppy bloom. At the end, he told her to be strong like a samurai but, it was he, the **chonan,** who carried her and responded day and through the night until the final transition. My grandson, Devon Oda, said she was like her large twirling glazed rabbit that sits in my living room that was always giving us joy. As promised, I sang a Japanese lullaby as her physical life was fading on her last night. She was 78 years old. See you later, Sis. Thank you to the Nishii family at the Saikoji Temple in Tamara, Kumamoto, Japan, where she will join her late husband, Kikuo, and to cousin, Noel Igauye, for giving her a home at the Evergreen Cemetery, Los Angeles, where the Sugimoto/Inouye family resides. The Cerritos City Council adjourned in her memory on July 11. Nancy Kyoko Oda, a leader of the San Fernando Valley Japanese American Community Center, San Fernando Valley JACL, Tuna Canyon Detention Station Coalition and other organizations, is the youngest of three sisters, including Frances Takeda, who passed away in 2009. Beautiful story of 2 sisters! Thank you Nancy!